The original discovery of Kolb Arch was recorded in 1871 according to a reference in an early edition of Arizona Place Names, but was unknown in modern times until spotted from the air in 1951, and then revisited by helicopter and named by Barry Goldwater. The arch (or bridge) is in the headwall of the arm of Nankoweap adjacent to Point Imperial and Mount Hayden but hidden from the overlook. 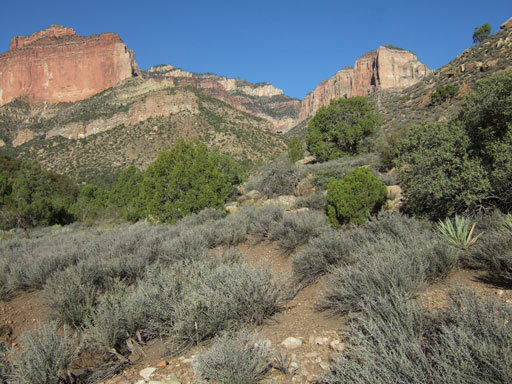 Few hikers get into the upper reaches of Nankoweap Creek, and the junction of the fork that leads to the arch is nearly a full day upstream from where the Tilted Mesa trail comes down to the creek bottom at the Butte Fault. Begin by traveling upstream along the main streambed which flows in all seasons assuring a good water source. When you observe the bare slope of Galeros forming the north slope of the streambed look for a fast track in the gravel along the foot of this slope away from the heavy growth along the water and dense brush near the bank. For a distance after this the streambed is not very difficult but soon becomes very much overgrown where the mapped spring emerges. Fortunately, there is a game track above the bank for the last section approaching the fork to the arch, which can first be seen from a distance in the very far center of this view. Attempting to reach the arch on a round-trip from a camp near Two Springs (at the Butte Fault) is almost certain to fail. After hiking upstream and considerable search we found a camp above the bank opposite the arch fork, in preparation to make a go for the arch the next day. 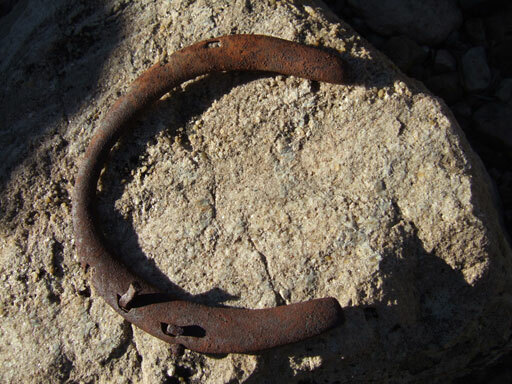 It seems rather fantastic but remotely possible that this horseshoe found in the area could be associated with the 1871 discovery. The streambed is initially unobstructed but there is a seep and a boulder jumble that is a problem to get past. A track above the bank on the north side runs past this obstacle. From the point where this narrow flat ends the remainder of the bed to the principle barrier at the Tapeats fall is easy travel. As the walls begin to close in it becomes obvious that the cliff and pourover slot requires a substantial climb to get up to the next level. There is a break in the cliff on either side, and there is no mystery, it could not be more obvious where the only two chances are. Reliable info is that either side works. Following a recommendation, we took the south break which is very dense at the bottom and very loose at the top. A boulder slope near the upstream cliff is the best start. Get above the cliff and contour the slope upstream. One advantage of the southside (northeast facing) slope is less sun, tree shade, and cooler temperatures. A major side drainage appears to be an obstacle approaching the slot, but descend the slope to the roots of an enormous ponderosa tree — this specimen is the largest I have ever seen anywhere below the rim and at this elevation is truly extraordinary. Then find the game track ascending the other side, and as soon as you reach the top start back down to the bed above the pourover. There may be a trickle of water over the rock here but you must not expect it. From our observation the other side also appears to be a good option with perhaps easier navigation but more sun, and that side is where the Goldwater rediscovery party got up through the cliff on their approach. The critical factor on either side is not to go any higher than necessary. There is always a faint game-track in these places. There are no further obstacles to reach the base of the arch, but many minor jumbles to climb up. The recent history of fire on the Walhalla Plateau above fills the drainage with ash debris and bits of charred log along the way. Some visitors here have managed to make the final climb to get under the arch, which seems to be possible on the north shoulder but exposed and slippery. The basin of the pourover under the arch is a good place to spend some time and appreciate the destination, and the final pitch is not required to fulfill that objective. Access to Kolb Arch is reported from other visitors to be a challenge, but our round-trip was 9 hours and we enjoyed all of it. Getting up through the Tapeats ravine to the top of the cliff was the hardest part and a place where loose rocks can be a hazard. Everyone in our group was adapted to rugged off-trail exploration which is exactly what we experienced. Take all the water you expect you will need for the day when leaving the reliable flow at the main streambed.